The site is one of the largest (other than the WTC) remaining development sites Downtown. It is zoned for a 1.3 msf tower. That's exactly the size of the 1 NY Place proposal, but of course that was with the broader base. To remain at that size, the tower would have to be reconfigured or increase its height. do something about train delays, it would almost be perfect! If they would make ALL the trains have the electronic voices like on the 5 train. sometimes when I was on others trains the operator would sounds muffled or he was speaking too low and fast for me to make it out. This may not be a problem for NY'ers, but for me being a 1st time tourist I needed to know what stops were coming up. So IN MY OPINION, having the electronic womans voice on EVERY line would make the subway perfect without anything else done to the whole MTA. WHat is the historic significance of the current station. It seems like a lot would be lost with it being totally upgraded. That said, I am in favor of the new streamlined design. What do you guys think? When the New York subway system is ready to blow a spectacular glass bubble aboveground, then you know that the climate for architecture in the city has really changed. With its proposal for the Fulton Street Transit Center, unveiled Wednesday, the Metropolitan Transit Authority has vaulted out of its subterranean dominions to get in on the action of shaping a dramatic streetscape. This is not the first new Upper World subway station of the high-design era. Two handsome structures at Stillwell Avenue in Brooklyn and Roosevelt Avenue in Queens are under construction. But the Fulton Street Station, when it opens at least three years and $750 million from now, twill be by far the most architecturally ambitious. A five-story glass cupola pops out of a glass crate and lists a little, not drunkenly but with rational grace, like a classical statue of a figure poised to move. At the top is an oculus, a great glass eye where a belltower might be, if this were a church. Instead, it is a transparent icon of rationalism for a dark and mystifying system underground - a bit of false advertising, perhaps, but also a beacon for the MTA's long-term hopes of bringing logic to its tangle of burrows. The Egg-in-a-Box will be easy to find. This is a revolutionary virtue in a city where most subway entrances lurk and hide their signs, as if to disorient an invading army. Down below, a sunlit circular hall should make some sense of the skein of converging train lines (the 2, 3, 4, 5, A, C, E, J, M, R, W and Z). Pedestrian tunnels will knit together portions of the system that were built to compete with one another. Foot traffic will flow underground between the Fulton Street dome and the great glass hall of Santiago Calatrava's World Trade Center Transit Hub - two crystal palaces also linked by the desire to produce some dazzle from the marriage of transportation and design. It's striking how consonant these two curvaceous stations are, great sacramental spaces covered in transparent skins and supported by visible latticework of steel. If Calatrava's building feels gothic and cathedral-like, Grimshaw &amp; Co.'s gives off echoes of a Renaissance cupola that has been pushed slightly askew. Both pay homage to Grand Central Station: Calatrava's, by emulating the old building's majesty; Grimshaw's, with a raised walkway around the dome, intended for restaurants and stores, but also as a perch from which to gaze down at the theater of transit. To make way for the terminal, the MTA will have to knock down several buildings. It has, however, pledged to preserve and restore the Corbin Building, an ornate, eight-story wedge faced with tawny brick and terra cotta, which qualified as a skyscraper when it went up in 1889. Squeezed alongside it and across the street from the pre-revolutionary chapel of St. Paul's, the Fulton Street Transit Station has a lot of history to contend with, and it does so fearlessly. After a long period when architects and developers seemed embarrassed by the past, they have begun relearning how to reuse, welding different periods by the bold use of contrast. Passengers riding up the escalators will face St. Paul's through glass, transforming the transit station into a display case for the church. The adjacency of the Corbin Building and the transit center will offer a lesson in two stages of advanced technology, more than a century apart. In a single field of vision, we will be able to see structures grow lighter, masonry dissolve into glass, and an elaborately decorated wedge merge with a sleek, immaterial egg. I couldn't help but think of the Mid-Manhattan Library when I saw this--two crystalline blobs escaping from boxes. Robert Moses, the master builder who uprooted many tenants in his day, said you couldn't make an omelet without breaking some eggs. He failed to mention wedges, woods, putters, irons and drivers. The latest project unveiled for Lower Manhattan, the Fulton Street Transit Center, will connect four subway stations under a crystalline glass dome. It will also almost surely doom the World of Golf in its building at 189 Broadway. Overflowing with golf balls, apparel and hundreds of gleaming clubs, the second-floor store opened in 1998 but had to close for six months after being badly damaged in the Sept. 11, 2001, attack. 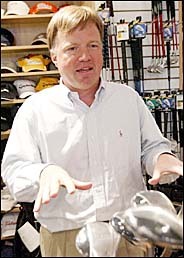 "I'm extremely concerned that this will represent the second death of this business," said David Braham, 48, an owner of the World of Golf, whose other store, at 147 East 47th Street, was opened by his parents, Stanley and Anne, in 1968. Almost every big project pushes out tenants, some quite distinctive. The Fulton Street center will affect about 140 offices and stores, mostly on Broadway between John and Fulton Streets, where the new transit hall is to rise by 2007. Many will move; others, undoubtedly, will close. The Metropolitan Transportation Authority also has its eye on 189 Broadway, at Dey Street, a two-story structure that World of Golf shares with a Chinese restaurant, a photo finisher, a picture framer, a clothing store, a lingerie store, a cookie shop and a smoke shop. On this corner, the M.T.A. plans an airy entry pavilion, with elevators, leading to the 4 and 5 subway platform, to the main transit hall and to a new underground concourse running to the World Trade Center site, the PATH terminal and the E, R and W lines. "It seems like a million people like it," Mr. Braham said, "and 140 people don't." Tenants will have a chance to comment at an environmental hearing next Tuesday and on the property takings at a hearing this fall, said Roco Krsulic, the director of real estate for the transportation authority. Tenants, he said, will be given 90-day notices and will receive relocation assistance and compensation for their fixtures. "The M.T.A. is extremely sensitive that we accommodate both tenants and owners," Mr. Krsulic said. What worries Mr. Braham is finding comparable, affordable real estate. The store is halfway through a 10-year lease, paying about $30 a square foot annually for 4,800 square feet of space in the financial district, where many of his customers are. "It's a great place to go at lunchtime when your head is pounding from work," said David C. Rubin, founder of the Rubin Group, an insurance brokerage firm on John Street. 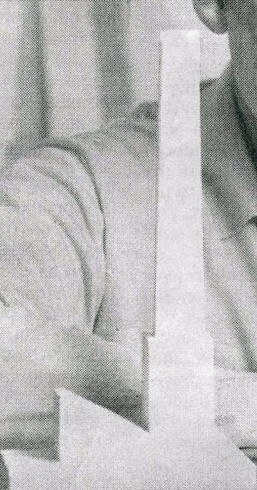 He recalled admiringly that Mr. Braham tracked down a hard-to-find Sonartec 3-wood. Just as important, Mr. Rubin said, "They're not going to let you walk out with a $119 wedge that may not be suited or appropriate to your game." The store has a tiny putting green and rooms where customers can be fitted for clubs or work with an instructor on their swing. The six employees are golfers themselves. Mr. Braham said he hopes to find a new store downtown. But for the moment, he said, he is distressed and desperate for information. "Everything I know about condemnation law, I've learned in the last 48 hours," Mr. Braham said on Friday. He added: "We totally understand that what's best for New York has to be done. But we're sad it's being done on our backs." David Braham, an owner at World of Golf, faces the prospect of closing the store's doors again. 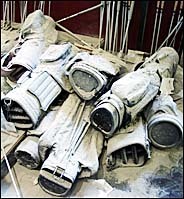 Bags and clubs littered the floor at 189 Broadway in Lower Manhattan after the Sept. 11 attack. What architect Andrew Whalley of Grimshaw calls “The View,” how the Fulton Transit Center would look from St. Paul’s Chapel. A model showing the center’s interior, which is on display at the Center Architecture at 536 LaGuardia Place. The $750 million design for a new subway center at Fulton St. and Broadway received glowing praise from resident leaders and transportation advocates at the opening unveiling May 26, but mixed reviews an hour later from some of the small businesses the new center will displace. During the presentation at the Center for Architecture on LaGuardia Pl., Wheeler showed pictures of the station’s notoriously unwieldy ramps and mocked the M.T.A.’s confusing signs trying to direct people to make subway transfers. The new station designed by Grimshaw, a London-based architectural firm, will have no ramps, a 100-foot transparent dome and easy connections to the 2,3,4,5,A,C,J,M,Z platforms in what will be called the Fulton Transit Center and an underground walkway to the E,R,W and PATH commuter lines under or near the World Trade Center site, a block away from the station. The M.T.A. plans to begin construction at the end of the year and be finished by the end of 2007. Gene Russianoff of the Straphangers’ Campaign was one of many who praised the new design. He likened the currently confusing mazes to an amusement park horror room. “It’s a Fun House and now it will be a fun house,” Russianoff said. He said unlike most of the other major transportation projects competing for federal 9/11 transportation money, the Fulton Center does not have a large group of opponents and should actually get built. About 20 small businesses, ranging from fast food chains, jewelry and clothing stores, would have to leave to make room for the center, in addition to some offices above the retail. The project’s draft environmental impact statement, which was recently released, says that relocating retail businesses will not be difficult because of the retail vacancy rates near the site. Wheeler said businesses and building owners will be compensated under the eminent domain laws. 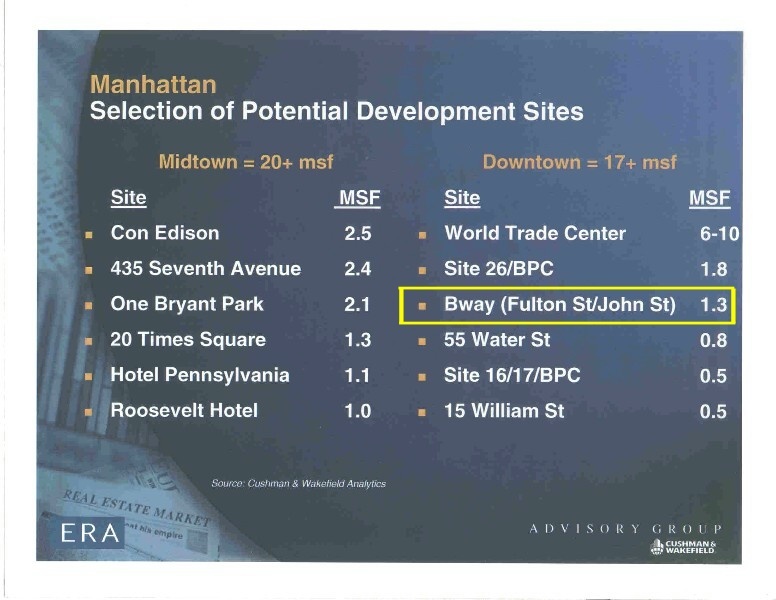 Under the preferred option, the five buildings along Broadway between Fulton and John Sts. would be acquired — 192, 194-6, 198, 200 and 202 Broadway. The historic Corbin Building at 192 Broadway, which also has retail spaces on John St., would be acquired and preserved, and the others would be demolished. There would be entrances through the Corbin’s arches into the center. The other options under consideration would preserve the Corbin, but not connect it to the center. Elfeky said he has not received any official notice about having to move but when he does he wants enough money to set up a new store near the current Manhattan Muffin, where customers have been eating freshly-baked goods for 14 years. He said his current lease runs until 2011. Elfeky did receive notice of the public meeting to discuss the environmental statement on June 8 at 4:30 p.m. at 2 Broadway and he plans to attend. One man who manages a clothing store that would have to vacate, however, was impressed when a Downtown Express reporter showed him a picture of the new center. “I love the design, but I don’t love to move from here,” said the manager. Wheeler said the first phase of the construction will be at the east end of the site near the 2,3 lines and will not require any property acquisitions. The M.T.A. hopes to have the Broadway buildings by the middle or end of 2005 when construction is expected to begin there. Andrew Whalley, an architect with Grimshaw, said the center will be prominently visible from all sides, unlike the hidden subway entrances now. He said the best look at the building will be from St. Paul’s Chapel, catty-corner to the subway hub. “‘The View’ is from St. Paul’s looking back,” he said. He said he did not design the building to fit architecturally with Santiago Calatrava’s proposed design for the $2 billion W.T.C. PATH-subway station a block away, but the Fulton Center will provide an easy connection to that hub. M.T.A. officials said they would consider using the MetroCard to allow free subway transfers between Fulton and the Calatrava stations, but no decision has been made. In addition to Grimshaw, Arup, James Carpenter Design Associates, Daniel Frankfurt and Lee Pomeroy Associates worked on the Fulton design. Wheeler said that there is little chance the project will suffer from cost overruns or have to be scaled back. “We’re very confident with the cost estimate and being able to stay within the 750 million,” he said. Wheeler said on a typical weekday, about 300,000 riders enter, exit or transfer at Fulton, making it one of the largest centers in the subway system. In response to a question about installing a system to let riders know which will be the next train leaving Fulton going to Midtown so riders can go to that platform, the M.T.A.’s Mysore Nagaaraja said it will take about two years to install a train locator system with a better public address system for the numbered trains and a minimum of six years to put in the same system for the lettered ones. hey, what does this "center of architecture" have in it? And how many high rises are being demolished for this? Is the egg glass structure bend it to the side a little bit or is it just the way the rendering is showing it? :?